Oppo has just announced R819 , with 4.7inch 720p HD display . Oppo is a very well known brand for its high end Android Smartphones like Find 5 . Now Oppo R819 is company’s latest mid-range flagship device . It comes with robust built and amazing specs . The device runs on Android 4.2.1 Jelly bean OS . It is powered by Quad core processor . The company is giving you Stock (official ) Android ROM option . The R819 is also know as Find 5 Mirror . The user can use Original ROM or he/she can install OPPO’s Color ROM . Oppo R819 powered by 1.2GHZ MT6589 Quad core Processor integrated with PowerVR SGX544 GPU . It has 1GB of RAM and 16 GB internal storage . To make the device more enhanced and user friendly it packs with Proximity sensor , Ambient light sensor and 4D Gyroscope . It comes with 4.7inch 720p IPS Display with OGS technology and 312PPI ( pixels per inch ) . The rear camera is of 8MP that has Sony Exmor Image senor ( f2.0 aperture) with LED flash & 2megapixel wide angle front facing camera . Oppo Find 5 Mirror offers Dirac HD Sound Technology for better multimedia experience . 4.7 -inch 1280x720pixels IPS LCD capacitive touch screen display with OGS technology . 1.2GHZ Mediatek Mt6589 Quad core processor , 1GB RAM . 8Megapixel auto focus camera with Sony Exmor BSI sensor ( f2.0) and LED flash , 2MP front facing camera . 3G , 2G WiFi , DLNA , GPS , FM Radio , Bluetooth 3.0 . 7.3mm thick , weighs 110grams . 16GB ROM ( internal memory ) , no expandable memory . Proximity sensor, Ambient light sensor, 4D Gyroscope . The phone is available for pre order in Europe , US , Japan , Hong Kong & Australia at Price of 36,000 JPY , HK$2,798 & 349 USD respectively . The phone will be shipped globally . The price seems to be bit more if looking at the specs . In in India we have lots of android phone that are having 1.5GHZ Mt6589T quad core processor with 2GB of RAM like UMI X2 , Gionee Elife E6 , Elife E5 , Jiayu G4 . The Find 5 Mirror / R819 will be available in white color . 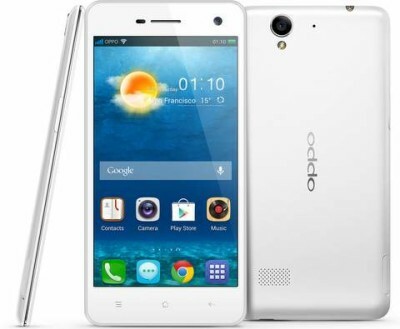 If Oppo R819 lunched in India for RS 20000 , then it may be disappoint the customers while buying it .